Mnangagwa’s comments were his first on the strife which has wracked Zimbabwe for over a week, during which the President was largely absent. He arrived back in Harare Tuesday from Switzerland, where he had been due to attend the World Economic Forum (WEF) meeting. “One week ago I announced measures to stabilize our nation’s crucial fuel supply. I was aware that these measures may not be popular, and this was not a decision we took lightly. But it was the right thing to do,” Mnangagwa said on Twitter. The leader, who last year replaced longtime strongman Robert Mugabe, returned early from the annual jamboree in the Swiss alpine resort town of Davos. Protests started last week after the government announced a 150% fuel price hike, and quickly turned violent amid a fierce clampdown by security forces. At least five people were shot by police and another 25 wounded during battles with protesters in the Zimbabwean capital. Human rights organizations blamed the police and the army for the violence. Sheila Matindike of the Zimbabwe Human Rights Commission said police officers used live rounds on protestors. 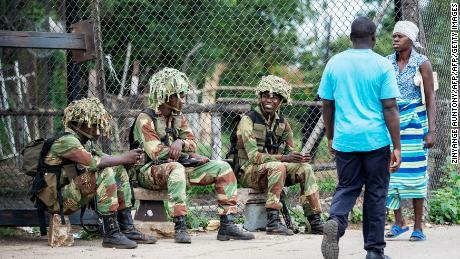 “At least eight deaths have been reported to the commission and mostly attributed to use of live ammunition,” she said at a media conference in the capital, Harare. “Whilst the police officers in charge were not forthcoming with their side of the story, the verified facts raise a lot of question around the crowd control capacity of the law enforcement agents,” Matindike said. “They seem to resort to use of brute, excessive and disproportionate force in most circumstances thereby causing avoidable loss of life and also worsening the situation,” she added. Zimbabwe’s minister of state for national security, Owen Ncube, confirmed last week there were casualties but blamed nongovernmental organizations, and other individuals working with the opposition group MDC Alliance for instigating the violence. As the protests raged, the country’s internet was cut off, with many Zimbabweans unable to access social media or check the news for updates on the protests. He returns to a nation engulfed in turmoil. On Monday, Japhet Moyo, secretary general of the Zimbabwe Congress of Trade Unions — which has been involved in organizing the protests — was arrested at Harare’s main airport on Monday and faces charges of subversion. Moyo was not aware that he was wanted by the police, Zimbabwe Lawyers for Human Rights spokesman Tinashe Mundawarara told CNN. 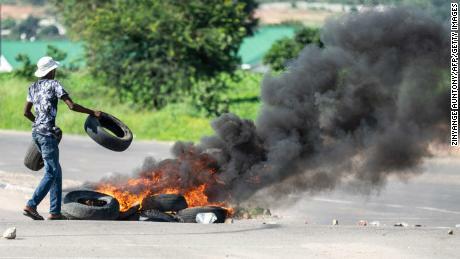 His union was one of the main groups calling for a general strike after the announcement of the massive fuel price hike in Zimbabwe. Also on Monday, the country’s High Court ruled that mobile operators should restore unrestricted access to mobile and internet services immediately, following a days-long blackout. 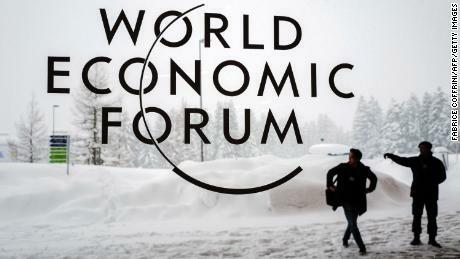 Mnangagwa joins a growing list of world leaders who will not be in attendance at Davos. US President Donald Trump decided the US delegation would remain at home, and British Prime Minister Theresa May canceled her visit to focus on the UK’s Brexit plan. French President Emmanuel Macron — who, like Mnangagwa, is trying to quell violent street protests — is also skipping the forum. Chinese President Xi Jinping and Indian Prime Minister Narendra Modi will also be absent. Journalist Columbus Mavhunga reported from Harare, while CNN’s Euan McKirdy wrote and reported from Hong Kong.